Friends, if you've been following along this summer (actually we started last May), you know I'd been commissioned to make two wedding dresses for this fall. This weekend I finished the first dress and today, Val, my client, took it home with her. 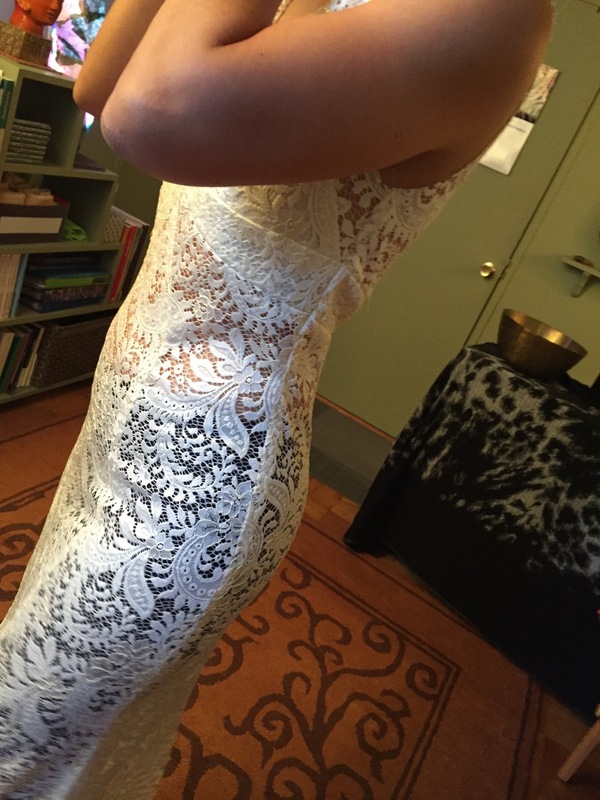 Val tried on dresses with a friend last spring and sent me photos of a vintage lace dress she'd seen and admired. Could I make her something similar? While there were things I liked about the dress, such as the overall lace and scalloped neckline, to me it looked too much like a nightgown. I didn't think it showcased Val's figure. And the lines were boring. So I did a little online research and found Vogue 1032 -- much more sophisticated. I ran it by Val. She was on board with it! We made an appointment to buy the fabric. I thought we could do V1032 in lace if we found one with a jersey-like drape. (From the get-go we decided to eliminate the train, which meant we needed considerably less fabric.) 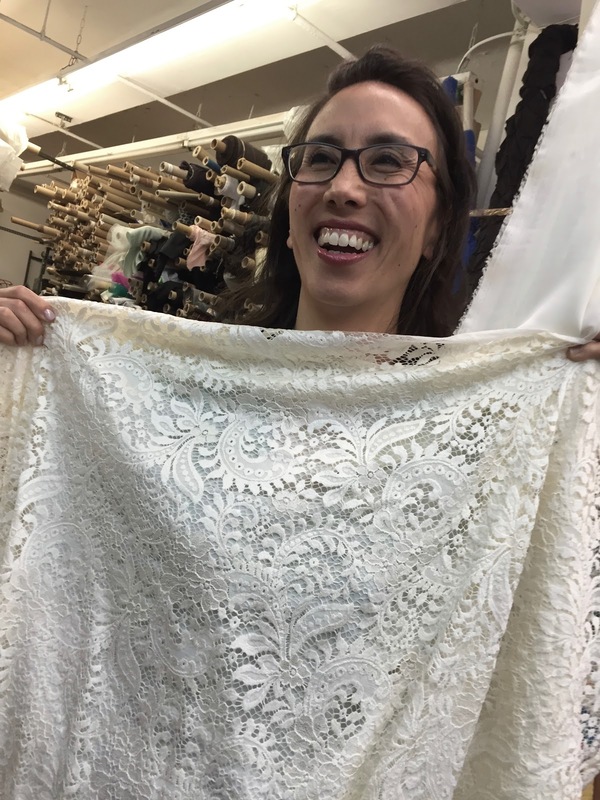 We met at Metro Textiles, and Kashi showed us a beautiful ivory poly-blend lace that was perfect and just $6/yd. That's right: the lace for Val's dress (we bought four 4-yard panels) was less than $100. We bought matching poly charmeuse for lining, though I ended up using just a bit of it, opting instead (much later) for a more stable ivory georgette at Metro for $3/yd. Can you beat it? Next we scheduled fittings. I cut a pattern Size 12. 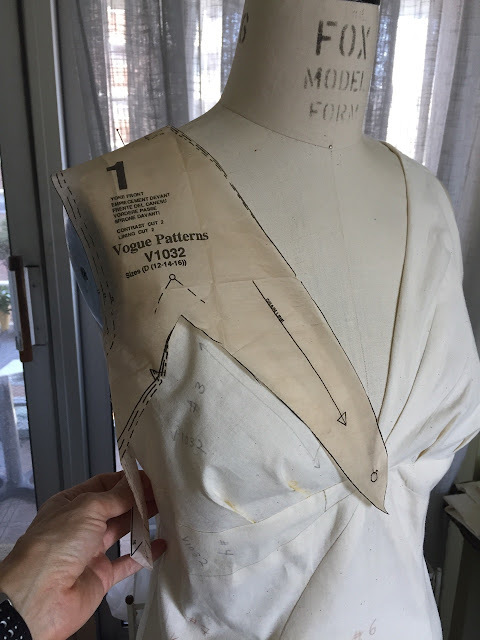 I had to do a lot of fitting in the back, where Val was narrower in the torso than the pattern; the front looked pretty good. I made a muslin first of course. I didn't follow the pattern directions precisely: I went my own way by choosing not to underline each individual pattern piece. 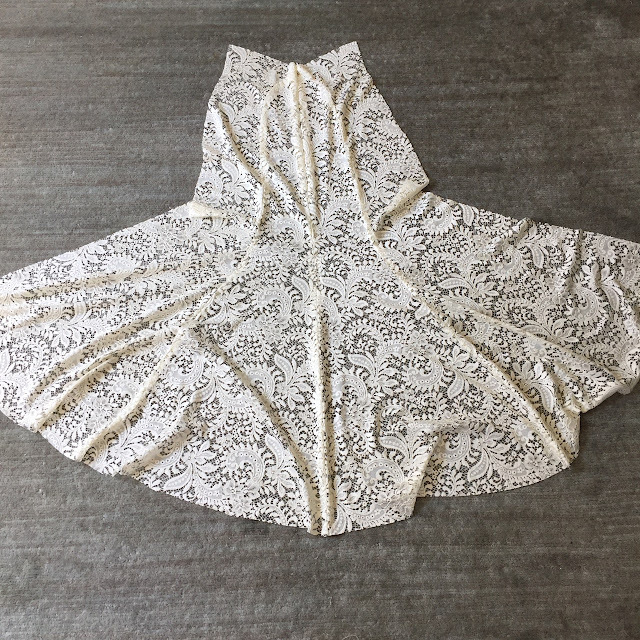 The bust area and narrow yoke pieces were underlined but the skirt is two separate, identical skirts: one in lace and the second in georgette. That way the beautiful seam lines remain visible and I don't have to worry about the two fabrics hanging differently. Val tries on the muslin. 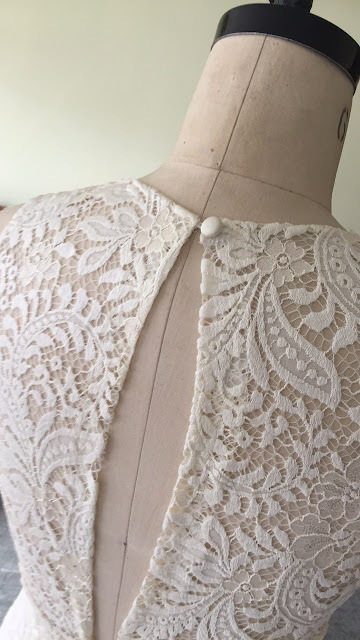 I tried to resist the temptation to overfit the back, since the muslin has very little "give" but the lace has a lot. 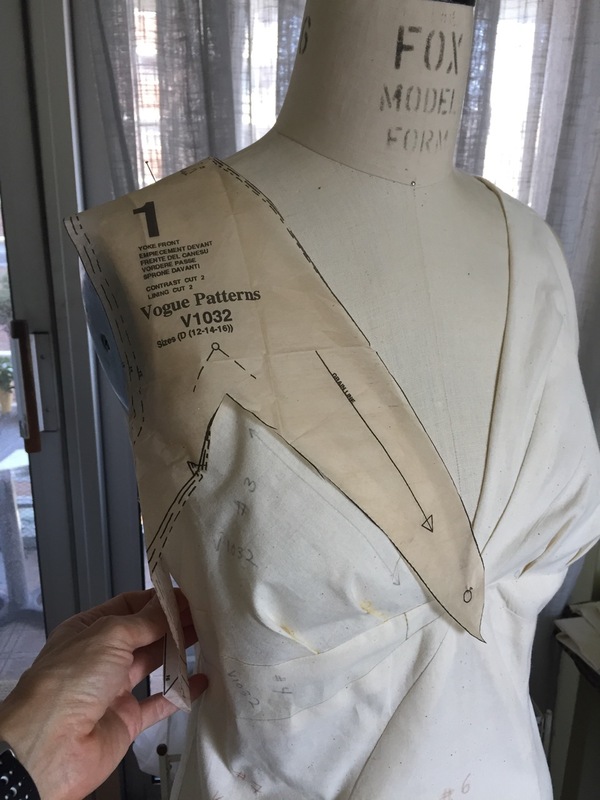 There was some question about how we'd handle the neckline and back which, on the pattern envelope, are done in a contrast fabric. My original idea was to use something sheer. But the silk organza I chose didn't work: too stiff, too opaque against Val's skin, just wrong. 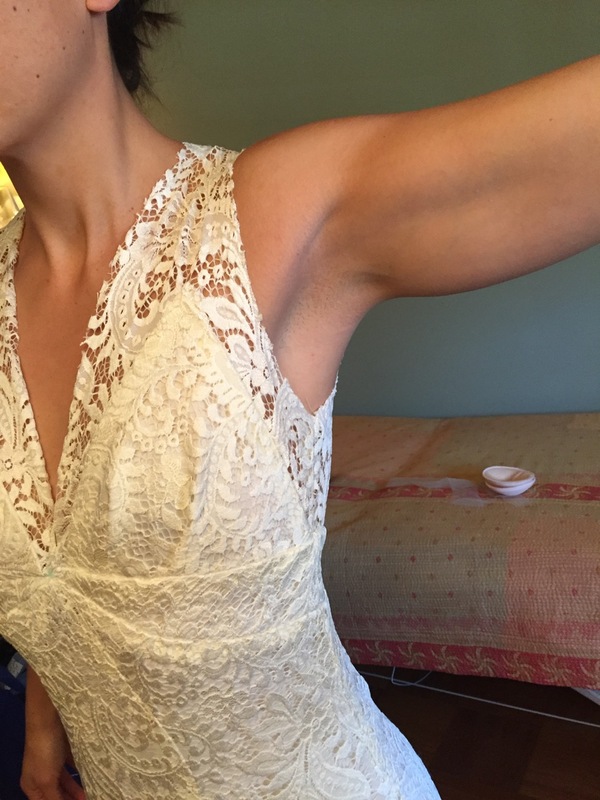 So we decided on going full-out lace with no underlining or lining, just bare skin. Bingo! 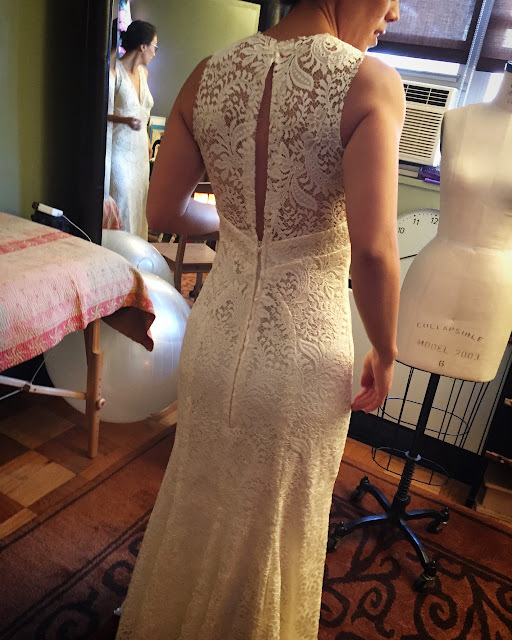 It was now time to make the final dress. I made the lace skirt first with no slip underneath. It fit great. Next I sewed up the georgette slip and attached it. Another fitting followed. Zipper basted in, still no closure at the neckline. We decided the front was more flattering with a thin bust pad. I purchased mine at Daytona Trim for about $5 (below). I made each pad its own charmeuse pocket (to mask the color) and tacked each pad to the bust sections. In addition to a traditional zipper, I picked up button loop tape and covered buttons. I didn't want to use hook-and-eye closures because I was afraid they might catch on the lace. The button loops -- at the neck and above the zipper -- work great. The hem of the slip is serged. The lace hem is finished with an ivory rayon seam tape facing. The bodice armhole and neckline edges are finished with silk organza bias strips and hand sewn into place. Today, Val tried on the finished dress. Lovely! 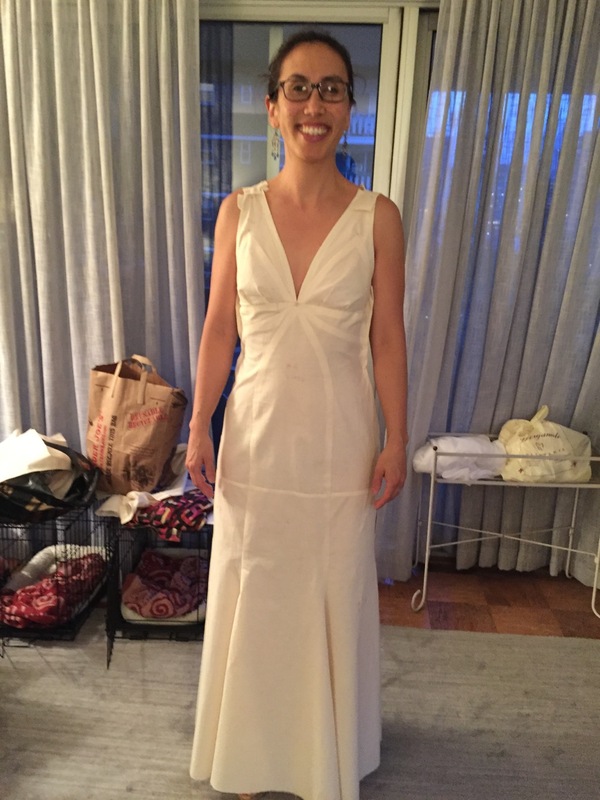 This dress -- my first foray into bridal sewing -- was really a joy to make though, naturally, there were a few stressful moments, but only a few. Stunning. Loved reading about the process. It's so elegant and much more stylish than the original. Bravo Peter, it's just beautiful. So beautiful!! YAY! And so much better than any RTW dress. Amazing, she must be so happy. The bride, the buttons, and the bust pads - combine beautifully. 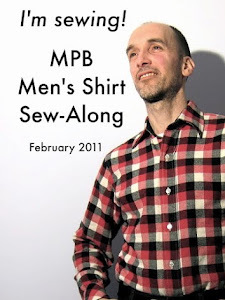 Peter, the lives you touch with your sewing is amazing. Val looks so happy in her beautiful gown. And I believe that the care that went into the making is sure to bring her happiness in the future. She looks so relaxed and happy . . . and beautiful. Success on all counts. Following along with the process was very interesting. I hadn't seen the inspiration dress before, but you certainly took what was appealing about it and took it to another level. 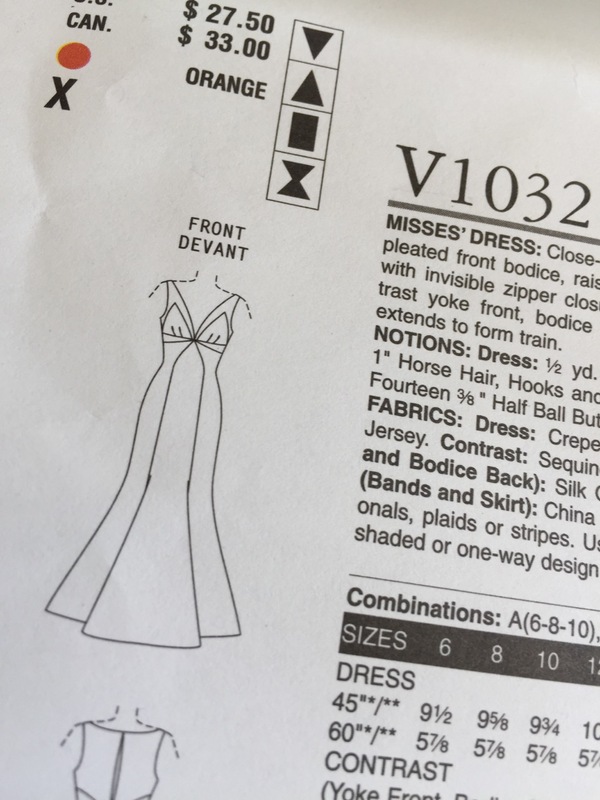 Looking forward to dress #2. She looks SO GOOD!! So slender, very flattering cut. <3 it! 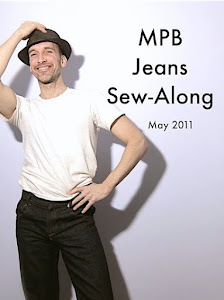 Wow - your sewing journey is incredible. I doff my hat to you, Sir! 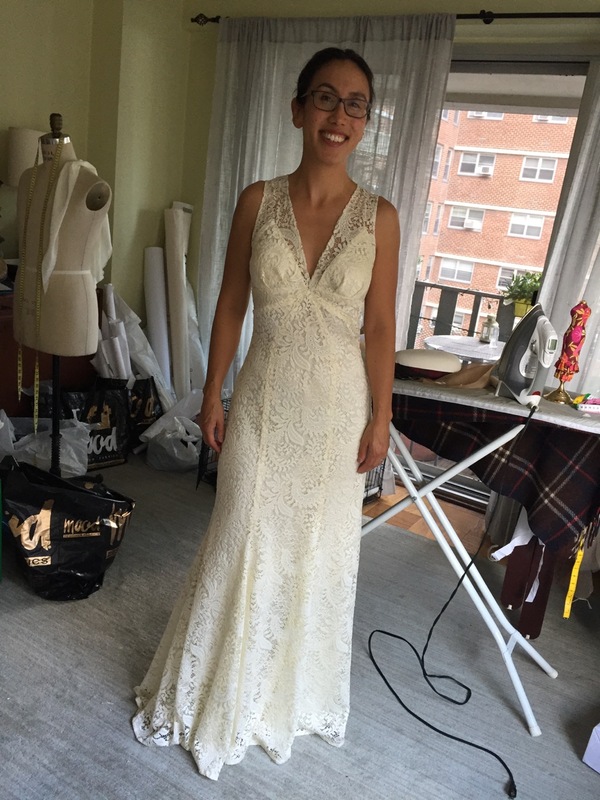 Congratulations on a great dress and a very happy friend!! It was really nice to follow along, thanks. What an incredible dress! 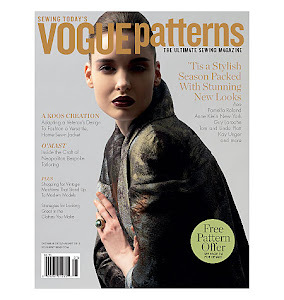 Looks fabulous on her with all of your careful alterations to the pattern! Thank you for showing us the journey to finished dress. Beautiful dress-beautiful bride! You did a fantastic job. You did a great job on the dress, Peter. I like the lace with no under layer. Val doesn't mind that you posted photos before the wedding? I'm curious, as some brides are a bit paranoid about keeping it a huge secret until she hits the aisle. I'll get one and share it. Beautiful work! I like your fabric choices better than those on the pattern photo! As always so inspiring to us all! Now my biggest question was how you went about eliminating the train? That certainly doesn't sound like it was any fun!! I simply measured down from the hip line an equal amount. That dress is gorgeous. She will be a beautiful bride. Amazing job! This fits perfectly. I LOVE the back skirt seaming. Beautiful! You do lovely work! The dress you sewed for her is just beautiful and does flatter her figure more than the first dress pictured. It is elegant and sophisticated. Great job, Peter. i hope Val will share a photo with flowers and headpiece/veil, whatever she chooses. 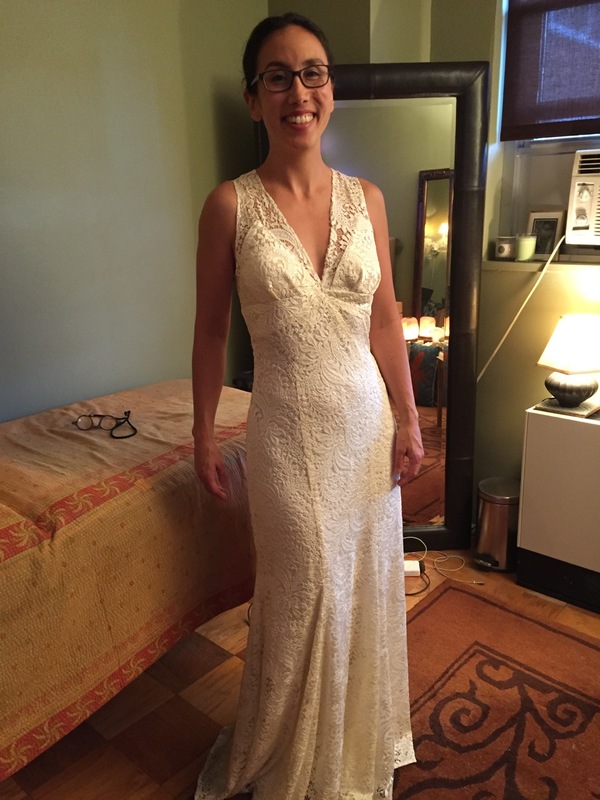 a beautiful dress for a beautiful bride. i love all the choices you two made. thanks for sharing. i'm hoping to see a chihuahua with some finery, however. This really is a triumph! 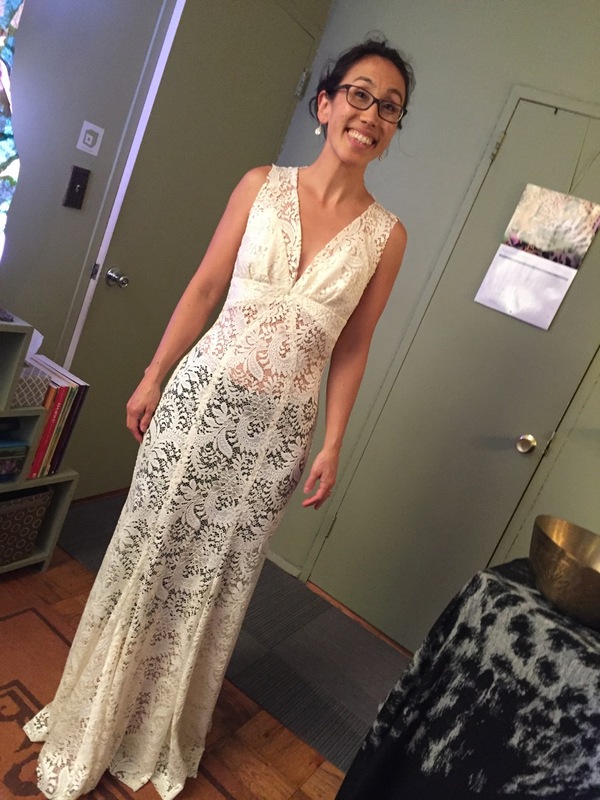 Such a stunning dress for a beautiful bride. 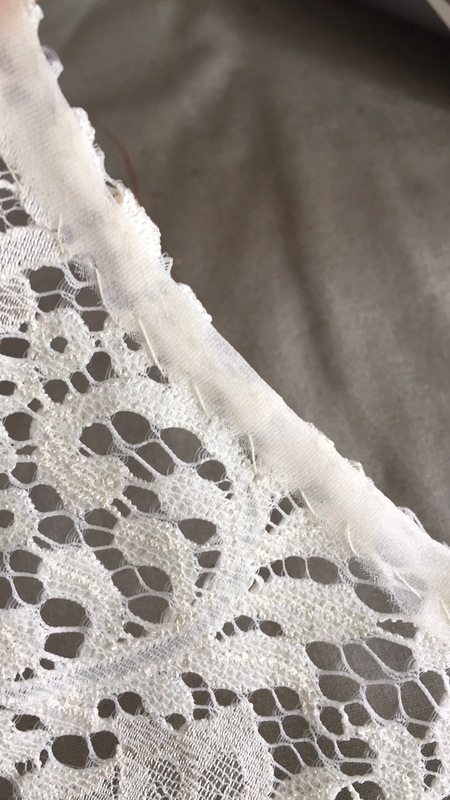 Initially, I thought the lace looked heavy almost curtain-like at the fabric store. What you created looks substantial but not heavy, it looks special, important and elegant. 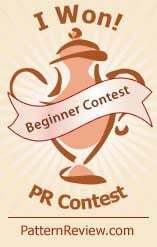 Your client has an excellent figure and I hope there will be followup photos. Superb fit and so darn flattering! Good on you for eliminating harsh linings and let skin show through. Be careful, when the word gets out that you can create beauty like this...you may be surrounded by ivory lace again! Wow, Peter! The dress is beautiful and brings out the beauty in its wearer. But also, I'm struck by how you brought your technical knowledge and aesthetic experience to commit to such a special process for a special occasion. Your example makes me want to be capable of doing something similar someday, to be involved in something so meaningful for both maker and wearer. Thank you. Gorgeous! Val must be over the moon. Beautiful Gown! It looks Gorgeous on her and with your alterations a perfect fit! A truely beautiful gown, what a perfect fit. She is a lucky girl to have a friend like you. Wow. What a beauty, Val and the dress. What an artist you are Peter. Wow, Peter! You've totally outdone yourself with this lovely creation. So glad you plan to post wedding day photos. Just wonderful! She looks so happy and you did a superb job! Just perfect on her! Your judgement and work are just super - well-balanced and very attractive look. I do love that lace!!! Like you need another compliment: BUT YOU DO! We all read Mrs Mole, and we all know a story about a bride who chose badly and how Mrs Mole made it work. But this is just magical from start to finish. I credit her good taste and your excellent skills. So lovely! 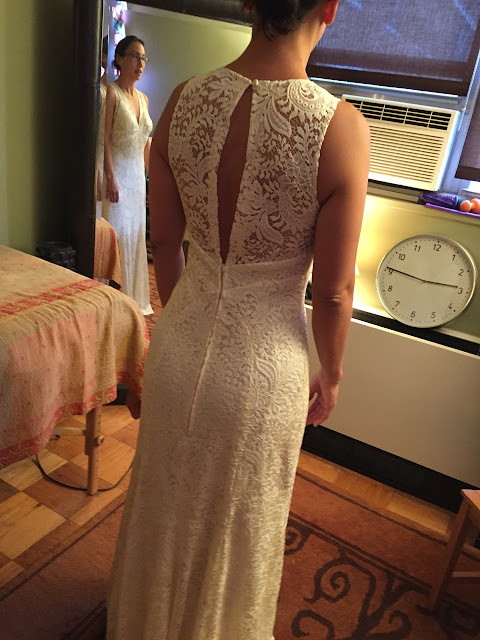 Wow, Val's wedding gown is truly exquisite! It was great to meet you and Michael this evening. So impressed, Peter. You've outdone yourself. Kudos to you. So beautiful! Fantastic work! I love her smile in every picture. Truly stunning. I cannot belive this is $6 lace. 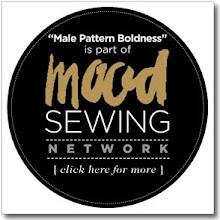 Just another reason why sewing rocks - couture for all! Woah! The perfect one of a kind wedding dress. The fit is sublime, and I love the style on her. What a lucky bride. Absolutely stunning! Great choice with this style too. Not that I'm surprised with all your great creations, but it's really beautiful, and much better than the dress she had tried on. Bravo! Wowza! The bride and the dress are just gorgeous! Peter, it looks marvelous. Very nice job! Have you considered finishing the hem with horsehair trim. I think it would have elevated the dress to (almost) a couture level. Otherwise a fantastic job! Beautiful dress! Glad I came across your blog. I'd love to be able to make something like this dress in a few years. Breathtaking! You did a superb job and you're lucky to have each other as friends! It's gorgeous Peter! Glad you used the organza for the hem. Absolutely stunning and fits her perfectly. I love the lace choice. Great job and she looks so happy. Peter this is nothing less than art. What a beautiful bride she is and will be on the big day. So elegant. Great job, starting with finding the pattern! Hair! Makeup! The blush of the bride! Peter, i'd be stellar to see a photograph of your creation in action (on the BIG day). Might the bride and groom share one for a future post? Stunning!! Beautiful gown for a beautiful bride. You are so talented--gown is gorgeous both inside and out. The dress i absolutly stunning! I have this pattern too, making this dress for my sister! 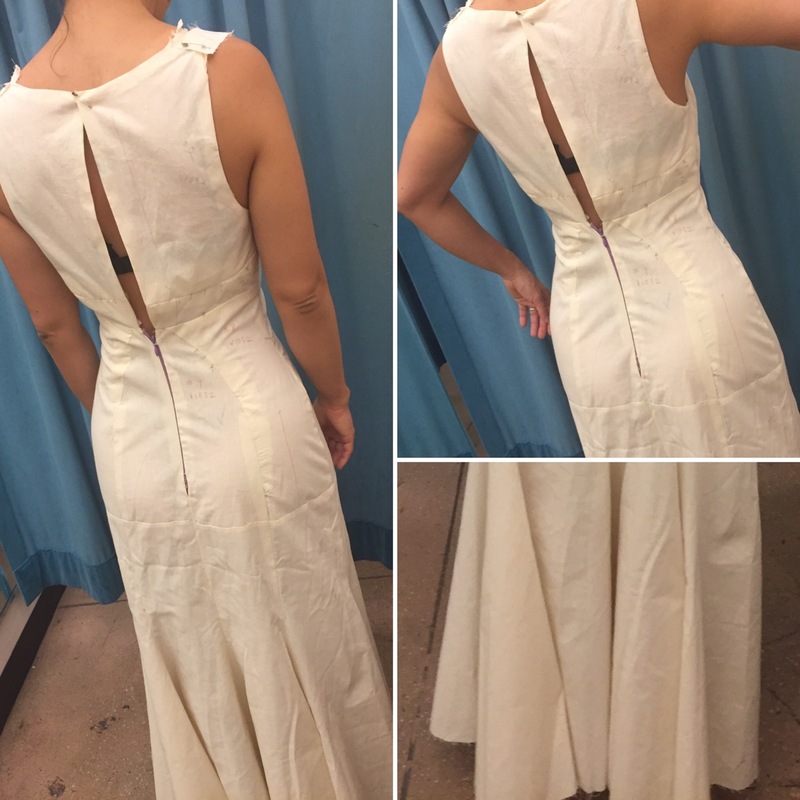 Loved your idea to make it with lacefabric! What a perfect wedding dress. 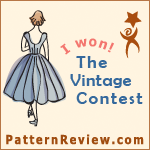 I love the fabric, the clothing patterns, the design and everything!